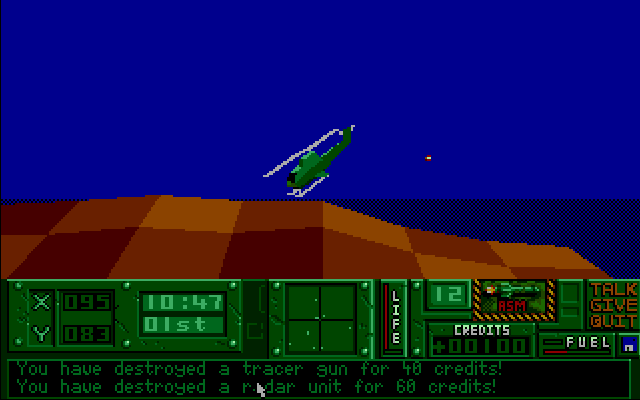 Hunter was released by Activision in 1991 and many consider it one of the first open world/sandbox productions. I think this is so relevant to today's modern gamer who might think there was nothing before GTA or Battlefield. All this takes place within a massive three-dimensional world where you are essentially a James Bond with objectives to complete for various missions. These are far-reaching and the key to success is strategic exploration, communication, and common sense. For example, don't drive off without remembering to find a jerrycan and why not look for a medkit too, you never know... It's always a good idea to stock up on extra ammo and to use a map. I knew this was gonna be good from the icons. It wasn't long before I was Howling Mad Murdock!! 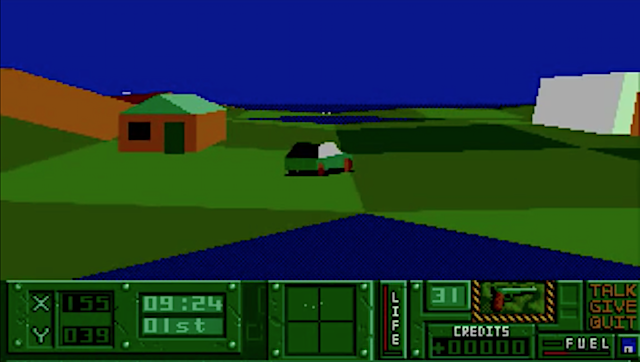 However, I often boot up Hunter to drive around its humungous world to explore and blow stuff up... life can be boring, so why not create a little mayhem and have yourself some fun! Actually, this freedom is my favourite aspect of Hunter because the player is completely free to roam and go almost anywhere they choose to do anything they like. This game is awesome and there's nothing like it. Jump in a jeep or sail in the winds - it's all up to you. In some respects, this is years ahead of its time and comparisons have even been made to newer games like GTA and Battlefield 1942. Even when played properly (yeah I should do that!) this is an immersive and engrossing experience with taxing missions that often require a tactical and explorational approach. The emphasis is always on your freedom and that extends into how you choose to complete the mission - there is no linear path to follow. 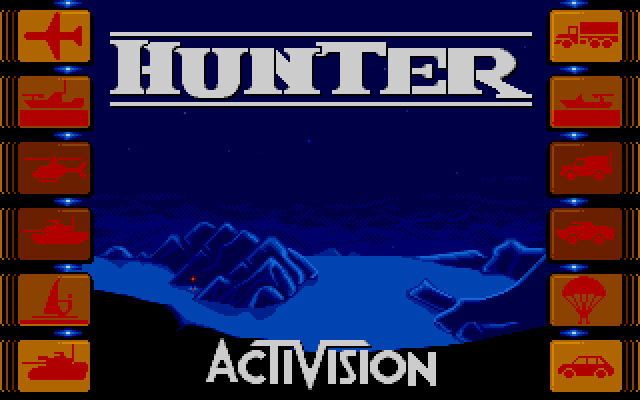 Hunter is extraordinary and I guarantee its one of the best 16-bit games you shall ever experience. I promise! - 8BitChip have created a hard drive installation version which I highly recommend. - Stonish has lots of floppy disks and I think Zuul #160 is the best. - Here is an entertaining video of Hunter (not for kids) and another video which is interesting. . . I play Vroom whenever I am frustrated with my progress (or lack of) in certain games, like The Immortal and Frontier. Vroom has such a rip-roaring attitude as you tear around the tracks and it's certainly captured that extreme thrill feeling. Is there anything better on any 16Bit computer? (The answer is no fwiw). What an amazing game!! - AtariMania has Vroom listed within their ST database and an interesting (French) interview. 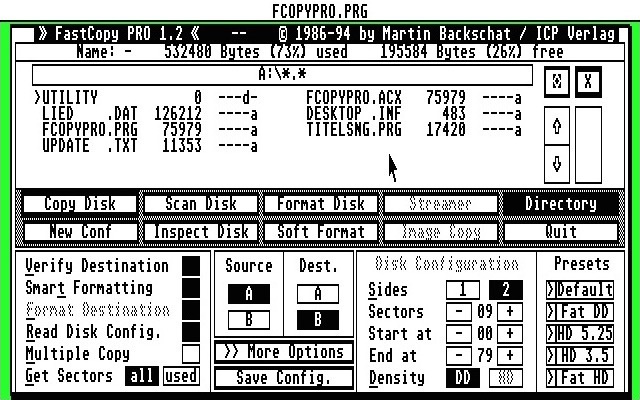 - 8BitChip have converted it to run directly from your hard drive! There are some programs that often don't get the credit nor respect that they so richly deserve. The ones that we use regular, they never let you down, and always get the job done time & time again. Yet, once their task is complete, they are TOSsed to one side with not so much care or a thank you. Do you know a downtrodden app? Shame on you! 1) A brilliant backup tool. 3) Very smart formatting. Woo! 5) Can run either as a PRG or an ACC. This is a compilation released by Ocean Software called Addicted To Fun : Rainbow Collection which features three classic Taito games : NewZealand Story, Bubble Bobble and Rainbow Islands. Now, I have already featured two of these games here at AtariCrypt but sadly I've never really "clicked" with Bubble Bobble. So I figured I should make friends with this game and loaded it up. The first thing I noticed is the tune, it never stops! I didn't see anything in the manual that says how to turn it off but it actually becomes enjoyable bewitching! The levels are all on the one screen and first appear humble in design, but somehow I get the feeling this is exactly how it's meant to be for maximum effect. There are a few monster cuties and you will need to blow a bubble and turn them into fruit. "Spookily" very similar to Rainbow Islands and deceptively easy on the early levels but, later on, it gets pretty tough! Don't dare bump in any baddies or you'll loose a life and sometimes they even fire back at you. There are lots of power-ups and I got another shock on level 5 when water poured into the screen and washed me away! In all honesty, I do still prefer Rainbow Islands over Bubble Bobble but this is an excellent game. I loved it and it is also a fantastic arcade conversion for our Atari ST and I'm glad we're now friends. If you've never played it then I suggest you also end your ignorance! As I have. - 8BitChip has Bubble Bobble ready to be installed onto your hard drive! - But if you need a floppy disk image then look no further than Old Games Finder. -> Stand beside a wall, close enough to blow bubble that instantly pop, for extra points! -> When you lose your last life, hold down the fire button and you can continue playing. - StrategyWiki that has a helpful guide which explains the basics for us Bub/Bob noobs. - Here is a cool web page and it's easy to see that the Atari ST has the best version. "...as the Atari ST came into my hands in 1987 I was very much interested in doing screen design with it: "Pixel art“ so to speak. In the beginning 90s I joined the Demogroup STAX and so Neochrome became my best friend for the next three years. Imagine a constant clicking for days and hours - that was me. Working with the mice on the Atari ST indeed was a pretty loud job, because it lacked the use of microswitches. The Advertisement said „Power without the Price“. Many fonts, logos and animations later we released our one and only Megademo called Revolution. Surely it wasn’t one. But for us (Matt, Mike, Tyan and me) it was an unforgettable experience. I quit the group in 1995 after Ataris Sales strategy was becoming more worse and never touched an STe nor a Falcon, although I watched some systems on the Fried Bits Coding Convention with very nice demos running. I studied visual arts then. Many Years later I rediscovered the demoscene via internet and caught myself listening to the old chiptunes again. I was constantly downloading Atari ST and C64 stuff, also creating some stereo-versions for CDs to hear it on a Hifi system. Yes, the music can preserve the memories of intense times. In the meantime I have rebought and refurbished those Homecomputers and improved the audio stage to clean up the analogue output. 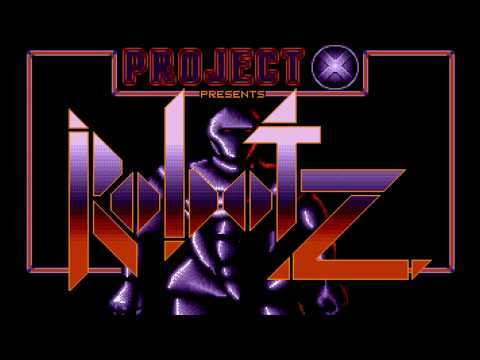 With the RockABIT Soundcloud I want to preserve the original sound of the machines - apart from emulators and software synthesizers - but also inspire the Nintendo generation to get in use of more variety from the past. 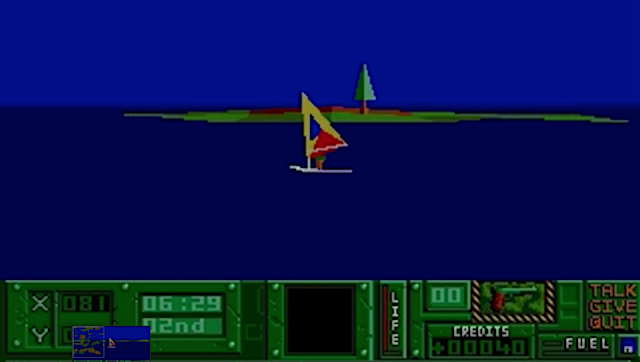 Because I was so deeply connected to the Atari ST, with it’s very limited (sound) capabilities, I always have been amazed about the will and creativity to break those limits. Nowadays dealing with something very limited has not only become a sport under programmers, but it also trains the mind to overcome the usual thinking path. Something very useful I think. RockABIT is 41 years old and working as a journalist (audio technology) in Germany." So, as an old member of STAX, I was immediately intrigued and asked for more information whilst I also went for a wander on Demozoo to see what I could find out. As 'Sodan' you will see that his graphical resumé is impressive! He also worked on H-Mec 2 which is one of my favourite Pacman clones on the Atari STe! Okay, I couldn't leave without recording a video for AtariCrypt's youtube channel and he's credited for his graphical works on the Atari ST demo Revolution (1992). My greetings to RockABIT - check him out on Soundcloud yourself and say hello! Exxos is pretty much a hardware genius who is always thinking of interesting ways to make our favourite retro computer even better. He has rescued old websites like Atari Music, UVK and also hosts ST Format cover disks along with the entire FloppyShop archive. Yep, he never seems to stop and will certainly be the only guy I'll trust to upgrade my own Atari ST. Chris is superb, a genuine guy with a legendary technical knowledge of the internal workings of our Atari computers! So I thought it was time that we all got to know a little more about this soldering-iron geek. Now, this is a pretty big interview so go and grab yourself a coffee, sit back, relax and read. I hope you all enjoy this as much as I have? My thanks to Chris for taking the time off from his busy schedule to write (waffle on!) and produce one heck of an interview! Don't forget that coffee folks and enjoy the reading about one of the biggest players on the scene today. Mr Exxos, please tell us about yourself. Hello Steve :) Well my real name is, as most know, Chris Swinson aka exxos. I should point out that I am not the company EXXOS who some confuse me for :) My handle is all lower case as not to confuse ;) I used to work in electronics repair for about 10 years. This was the leisure industry, So all kinds of fruit & arcade machines to juke boxes I have repaired over that time. My main area was Audio systems, From CD players, to higher power amplifiers to electromechanical juke boxes. I also ran the company BBS system, which was a dial-up network for depot's to download software updates. That system sucked, so I re-wrote the software in VB6. Things which took hours to do, now took just moments. As many know, I have been trying to build a shed at my girlfriends house for the past few years so I can once again start up my experiments. Last time I powered up was in the house. I managed to fry my dads radio tuner, basically because it had a antenna.. which picks up radio power.. only my radio power was a tad to high and fried it. Also I fried my mums TV, oddly that also had a antenna. An unexpected side effect was the mile long telephone cable which ran to the local phone exchange. The BT guy never figured out why the card in the exchange was melted when they are apparently protected against lightning strikes. As to what killed the exchange remains a mystery. Of course it was cool to watch all the metalwork in my workshop sparking to everything else. I once had my carpet glowing purple, that was awesome, talk about your hair standing on end! High voltages are just awesome. Can light up lamps without any wires, statically charge things several feet away and then get them to light up lamps. The whole thing is just awesome. I really want to get back into these experiments, and with digital cams being affordable in recent years I want to document my work better this time. There is some work on my website though it has not been updated for a long time. Which Atari computers are you using? The odd thing is, I don't actually use any working Atari at least currently anyway. I just don't have the time :( My trusty STFM had a video fault a year ago, so its been in bits. That was really 1MB RAM and my 1.44 floppy upgrade. It was a really old machine. Though once I get some time I plan on updating it and bringing it back to life. That machine was at my girlfriends were we mostly played games. What is your own Atari hiSTory? I used to years ago. Not so much in recent years as all my time is taken up with work or hardware development. I loved games like, Super Cars 2, Termodroid, Squareoff, Dungionz, Starquake, Xenon, Vroom, Chuck Rock, Castle Master. That game took me 25 years to finish, my girlfriend helped a bit ;) Back in the day, games were expensive and cash was limited, so mostly I was doing a few swaps with game menus like automation. Though I had very few games back then. A lot were free on cover disks. STOS is the main section on my site, I try to keep everything STOS related all in one place. The games, I could do more pages, but with larger indexes and others hosting them, then I don't think its worth taking up the drive space with re-hosting the same stuff. My site actually comes to around 35GB! I wrote the Floppyshop site as a searchable index where people could search and download PD. Almost everyone will have a copy of the collection, but just having a copy isn't using the stuff. I felt a lot of PD was simply "lost" so The Floppyshop page was born. Sadly the page got practically no hits and wasn't ever used. I had almost completed "FAST PDL" and wanted to upload that, though with time being limited and no interest, that project was abandoned. I have Automation and a lot of other game menus on my site. Years ago I uploaded them all onto funnet FTP. It was all on dial-up and think it ended up costing me around £400 in internet & phone charges to do that. I had little money back then, so I really struggled to pay it off. I tried selling PD CD's and tracker CD's, but they never sold. I have cloned some sites which are important. Recently I hosted the UVK2000 site and took over atarimusic.net which is a total mess to say the least. I barely got it running on my sever, and its a wonder it ever worked at all. I spent much time debugging that site, getting it in some form of working order. Though there is that much wrong with it, I started coding a new site. Though same old story, lack of time, I had to put it on hold. Though I wonder if its really worth investing the time fixing the site and updating it if nobody is ever likely to use it. It probably will get done eventually, though its not high up on my to do list. I've basically been rescuing sites lately it seems. I've taken over hosting for the STEEM Engine emulator. Steve does a great job maintaining it and when he ran into hosting issues, I helped him out. I use Steem a lot myself and its to important for it not to be easily accessible. What's the fascination with STOS? The main reason I wanted a computer was to write my own games. I remember looking though Argos year ago, seeing a few pages of Atari ST's in various "packs". I went for the discovery pack as it had STOS "the game creator" so its the one I went for. Oddly there was only 1 Am*ga for sale that I remember, which looked a bit "dull" software wise so I never went into Am*gas. So you could say if Argos never had the discovery pack with STOS included, then I may not have ever kept with Atari's. I did do some programs. Though they got rejected by the PD houses, basically because there was to many typos or spelling errors in stuff. They were programs like "Data Card" which was like a address book type program. The only stuff which saw light was MEGA Diskzine where I did 4 issues, with help from a few others. With STOSSER vanishing at the time, I wanted to do my own zine and keep the programming aspect in STOS, but also add Tesla coil type stuff, sci-fi or anything odd strange or cool. So MEGA was born. I barely got issue 4 out, contributions were next to zero. I was doing most of the work myself and about that time I had started full time work, So I simply didn't have time to do the coding anymore or write articles. I have a epic amount of STOS projects I started but never finished. Mostly I always hit the "ST is just to slow" to do anything I wanted. So later, when I got my Falcon, I started coding that and I always liked the game "Plop" on the ST so wanted to do a Falcon version. I contacted the guys who wrote Plop asking if I could get the source code, basically those guys were far from helpful and basically got told to bugger off in the end. So I did a Falcon port called "Its great". The playing screen was in 256 colours in 640x200 I think and I spent most of the time coding the AI. Due to lack of time, the game got abandoned although the last build is actually on my site still. In the late 90s, I realised that the Atari machines were just not popular anymore. The Falcon just seemed to vanish along with the Atari mags, game houses the whole lot basically vanished over night. I built my first PC, 286, DOS thing and after some time later I got programming in VB6 where I started to port over my "its great game". Though again, lack of time and really lack of motivation to finish it, it never got finished. Though about 2 years ago I did sort out a lot of old backup CD's and resurrected the game and fixed some bugs and compiled it. Though the A.I needed a lot of time to program, so it once again got put on hold. I did the odd tracker and chip tune back in the day, though later I moved over to the PC for music (shame on me I know). But I was a tracker guy, so I wanted something more powerful. All my released tunes are on my website. Do you have a favourite upgrade? I think my favourite must be the 1.44 floppy kit. It marks the first kit I designed and got working and its even still produced today. While most of my work is in the boosters, I of course like the V2 for example. But once something is designed and finished, I somehow start to hate the thing. Its old, I could do better, I want to add more features. So Its design pretty much goes out the window and I am always thinking 2 or 3 steps ahead into the future. I have so many things on the go currently I can't keep up. My own designed PSU has become popular, so with people asking about a more Falcon specific version, I have designed and got the PCB's made for that. Though no time to build one up and do the testing yet. I also have designed a MEGA STE PSU, but that had to go on hold as it's proving difficult to squash the whole design into the PSU case. So I am not sure what to do about that currently. so its taken a back burner for now. I also have designed and basically built a STM PSU. Those external types are failing as well, so I have not forgotten about those. I already brought a stock pile of bits to go into production, but again, lack of time to work on it. At some point I was doing Falcon video adapters, for VGA and Scart.. again, lack of time to do the work on it. I also have a new Falcon RTC module under design. Again this is doing slow due to lack of time. Though likely that may see the light of day over the next few weeks. As many know, I am still working on the CPU boosters. I recently went into production with the V1 STE booster which runs at 32MHz. I've basically hit the limit speed wise of the 68000. So I have drifted over to the 020 and 030 CPU now. Ultimately I want something along the lines of a 50MHz 030 CPU, with 32bit access to ROM & Fast-RAM. Though this project is riddled with issues like you wouldn't believe. Likely there will be some 030 32MHZ 16bit boosters appearing first. Then once that design is stable, move over to 32bit. Again lack of time is the main issue, as all my free time is going on building PSU's and putting together the STE boosters. I think a 32MHZ 030, even with 32bit ROM & Fast-RAM likely wouldn't take to long to do. In fact I've already designed it, but I am held up with some PLD programming issues so I need to solve that first.. again lack of time is the main hold up there. Going back to the STM, I designed some more universal TOS 1.4 upgrade kits. Though finding the time to assemble and test them is proving difficult. So I am not sure when they will be on sale. England's own Jookie / Lotharek? Tell us more! I don't really know why I do this stuff lol. I guess I just love to design stuff and seeing it working in a computer just gives me a warm fuzzy feeling. I think its an addiction. Like when I produce the first 16MHz booster, I though yayyyy I've done it, its stable, now onto 32MHz... It never ends. Just seeing those benchmark results pushing up higher and higher just wants me to push them up ever more. I'd like to get the super speed hard drive working properly that I have been working with PPera for a while. Though we are both so busy that the project always takes a back seat. We have jookie producing Ultrasatan so it's not like there is a huge rush or demand for more drives. One thing I try and avoid is producing stuff that others are doing. For one it's not really fair on jookie if I produced a hard drive, though it's a bit pointless basically re-inventing something which is already been produced. Similar with lotharek and likely others also. So it's one reason I am not in a hurry to finish the hard drive off. It does run super fast, a lot faster than any other drives, but with possible DMA issues, its hard to get reliable write operations. So while I could produce a slower drive, its nothing new as it were. If I can produce a drive which is super fast, then that would be something people could be interested in. One thing which really doesn't help, is when others start producing items the same as I am doing and possibly selling them cheaper. Here I am talking about PeST, a project which enabled the use of a PS2 mouse on the Atari. I had a fair amount of sales with that, and its what funded my developments back then. Problem being, when I started to move away from ebay, my sales started to drop. Not only that, I think some polish guys started selling a similar adapter and it basically put me out of business. Of course I was making some money from those sales, but it was being invested in other developments at the time. So it halted progress for a long time as I simply had no funds to continue work. Though its one reason I started moving onto boosters as people would be less likely to try and start selling some sort of “clone”. In a way, its good that people are producing hardware for these old machines but pretty much all the sellers are just in it to make a few quid profit. For me, the money I make on sales of items goes back into the “project fund pot” so the more sales, the more cash I have to produce more hardware. I don't just pocket the money and that's it, it all gets invested into more developments. While money is tight for a lot of people, I can understand them going for a cheaper product, but its also a slight kick in the teeth as I am trying to support the community and a lot of people just buy something else instead. For example, if I sold some Atari part for £5 more than anyone else, most will go for the cheaper item. Its just human nature to find the deals, I do it all the time. Though that extra £5 on my sale is considered a donation. Where that money is invested into future developments. I mean its not like my items are £100's more than anyone else's. Just a pity there wasn't more people willing to send a burger or a coke my way kinda thing. A lot of people complain there isn't any new hardware developments for years then, when there is , they don't help support it. Don't get me wrong, there have been a lot of sales over the past few weeks with the V2 Booster going into production recently. Also the STE booster going into production along with the new PSU's. The V2 booster sales funded the ST PSU project, The ST PSU funded the Falcon PSU etc. So you can see how it all works. If it wasn't for those guys buying my items, then likely I would have given up and closed shop a long time ago. So big thanks to those customers as they really help fund more productions which at the end of the day, helps more people and gives me motivation to continue. Your girlfriend deserves a medal for all the silicon clutter! How many Atari ST's are dismembered? Well, I don't live with my girlfriend, its why I am not around on weekends. I've taken over her space with all the Atari stock, she doesn't mind one bit. She has the stock which is for sale, and she packs the orders and posts them for me. No surprise I just don't have enough time to pack orders and make trips to the post office. So everyone in Atari land should be thankful she posts the stuff for me. I'm not sure how many ST's I have. Probably about 10 STE's, maybe 30 STFM's and then about 30 various motherboards. In general it seems to cost about £35 for each machine as a general figure. So around £2,500 probably in machines alone. If you priced up all the upgrades as well, that would be tough. Things like the V2 booster, they are about £65 each, If I have 20 of them its £1,300 worth of stock. Similar with the 4MB MMU RAM upgrade kit, they are about £65 as well. I think I totalled that stock to over £2,000 a while ago. So if you factor in I have on sale around 40 different items, some are not expensive parts though, then you could probably take a guess of what the stock is worth In total. I would guess somewhere around £15,000 of current stock. Though that doesn't include the huge piles of PCB's everywhere either. A lot of “stock” items are built up as I get orders for them, so I could have 100 PCB's but only 20 made it to “stock”. I could probably take a guess that if everything was put into stock it would be around £50,000. I can't keep huge stock levels, as if you price up every single part, for every single upgrade, then the cost would be far greater than I could afford. I think a lot of people don't realise the costs involved with it all. I'm paying around £200-£300 in parts every month for keep the kits I sell in production. I spent about £100 yesterday just on transformers. Also around £200 couple weeks ago for ROM's for the STE boosters. So while I do try and keep a small stock of everything I produce, I just can't afford to keep huge stocks of everything, plus with my day job I just don't have time to spend a couple weeks building up a 100 of something. Though with items not being in huge demand, My aim is to build small batches of items. That way I can get bulk buy some parts a little cheaper to keep costs down. There is no use in having 50K worth of stock if only a handful of items sell so I have to be very careful. Where did Atari go wrong? Oh gosh. I think this has been a huge debate for a long time. Lack of expansion seems to be popular. Though the ST did have the cartridge port which could do a fair few things. Atari knew expansion was needed as they produced the MEGA with a expansion port. While the ST wasn't born with PCI slots to easily update it (PCI wasn't invented for some years later aka sarcasm maybe) I think Atari limited the ST's design too much. Everything is just so tangled up that if Atari had some better forethought and built the ST with the idea that one day people might want a faster CPU, then maybe there would have been a lot more hardware add-ons produced by 3rd parties such as Fast-technologies etc. If people could have just cut the clock pin on the CPU and ran a higher clock speed and have it all work fine, then I think a lot more powerful machines would have appeared and maybe the ST range would have lived a little longer. This backs onto my second point. I heard the Falcon was basically a 030 bolted on the STFM's bus... If Atari also produced a 030 addon upgrade for the ST, then likely they would have sold a lot. Atari also added better graphics, which was much needed, a DSP for sound stuff, so the Falcon updated the ST's design into the next generation. In that respect they did a really good job. Atari should have been clocking 50MHz 030 and have released it at least 2 years sooner. I think Atari fell into a type of "trap" which is something I try to avoid myself actually. Why do a ST 030 booster when we can have a whole new machine? Why stop at that even, lets spend more time on updating the video hardware. Why stop at that? Lets add a DSP to help those audio guys out, let people play tracker tunes on it without taking up CPU time. Lets updated this, and that and take several years doing so until we get a awesome machine that we want. The fundamental problem is, waiting too long to produce hardware, and producing hardware on a "as perfect as possible basis". Take my hardware for example. I've only just developed the simple 32MHz booster. Four years ago I was producing the 16MHz simple booster. I had to design the 16MHz one first, make sure its stable, then build on that for the 32MHz design. If I had just jumped right to the 32MHz design, then it would have cost me all the research time and cost on the 16MHz stuff for starters. People would have had to have waited 4 years before they saw any hint of a booster. Even after sales of the 32MHz kit, I wouldn't get the money back which I invested with the 16MHz stuff. So after 32MHz sales, I would have no funds to develop the next series of booster. Also Atari had in the mix the STE, MEGA, MSTE, TT and also Jaguar. They had a really hard time in working out what would sell and what wouldn't. Of course its easy to say this 30 years later. Atari had problems with IBM PC's and the war of the consoles. By the time Atari finished faffing about with all the machines, it was to late. They produced the Falcon which was just to little to late. If they had produced a ST addon card, a 030, with a DSP, then at least it would have given the ST series a speed boost. The DSP likely would attract music makers and even programmers to make us of it. Then if they kept it compatible with the upcoming Falcon, then software could be run on both machines then bring in the Falcon with its better video modes. It goes back to lack of expansion really. If the CPU could run faster easily, then a lot more addons would have been built. Though in my eyes, Atari made one tiny little mistake in that respect, and basically caused a brick wall in CPU boosters. Of course back in the day there was no way to speculate that people would want a faster than 8MHz CPU. If Atari had "over clocking" in mind right from the start then I would think Atari machines would have lived a lot longer. As for the PC side of things. Atari got people coding, but the hardware not being easy to update I think made it hard work for computer geeks of the time to do anything with them. The geeks wanted to upgrade and Atari couldn't deliver on that. Then IBM machines came out with huge ISA slots to upgrade anything really. More RAM, a plugin ISA card, better video, another ISA card. CPU's not so sure about back in those early days, though likely they could be overclocked or CPU's updated for faster versions without to much trouble. Of course Atari had the MEGA machines with a expansion slot and more room for it. I don't know the time lines back in the day. Though I would suspect Atari saw the IBM's as easy to upgrade, and becoming popular so they went over to a similar desktop looking machine. Though by which time, the IBM's had already had a huge foothold in the market so it was likely to late for Atari to seriously compete but its all speculation really. Overall the Atari couldn't easily be upgraded which was the first nail in the coffin. Then when Atari did start with the 030 CPU, the second nail was they never produced it as a add-on kit. I think the geeks in the day would have loved to hack in a 030 into their ST's. It would have kept interest for hardware and software developers for a lot longer. Nobody has a crystal ball as to what will sell and what doesn't. Atari made the best choice they could probably make back then. They gave us the ST line of computers and they are sill around even today. If you asked a STE user do they want a “super STE” with an 030 CPU and no other upgrades, or a Falcon with lots of enhancements, but this would take 10 years longer, then you can probably bet people would want the “super STE” as they could always upgrade to a Falcon at a later time anyway. What do you think of the current scene? I think The Atari world hit a bit of a slump until fairly recently. There has always been a community, though it's not like the peek of the computer boom in the 80s kinda thing. There are more hardware guys about today like jookie developing hard drives for us. I think that has helped as people can download games images and play thousands of games. I think as people buy their First Atari ST, if the first couple games they play are just random, and the chances are they will be, lets just say, bad games. Just not enjoyable to play. It's likely going to put that person off and they may not bother with the Atari ST again. Though if there are sites reviewing games, good ones which are fun to play, then chances are those new Atari people will keep coming back for more and more games. But it's not just games, there are music people out there using MIDI stuff. I'm not sure if people would bother to do word-procession or print letters out these days, so I think Games and Midi are what people would most likely to use their machines for. Does the Atari ST have a future? I actually started a thread on just that on a forum not long ago. My concern is: as the ST's are failing, due to bad PSU's etc, in 10 years time there is likely not going to be any working Atari ST's. If they are maintained, like a new PSU etc, then the machines life is greatly extended. I think its important to keep these machines running, which is why I build things like new PSU's as its one of the most common things to fail. As you know, I have a lot of machines, and I was seeing PSU's fail all the time. It turned into a small epic where I now have a stack of about 30 PSU's all needing fixing. As many know, I want to increase the speed of the ST. While games were great, a lot of them could run smoother and faster to give a new depth of game play. Things like castle master run a lot faster even with a 16MHz boost and it's a lot more enjoyable to play without the 1 screen update every 2 seconds type of game play. If the old games were “even more enjoyable” to play, then that would be good thing. Maybe in times to come, people will tweak games to make use of the faster CPU speeds in such kits. I'd really like to see those FPGA guys develop a 100% “drop in” replacement for the various Atari chips. If the MMU could be updated to support SRAM and higher CPU speeds, then it would bring a huge gain in speed to all Atari apps and games. Though currently, its somewhat disappointing that nobody really wants to develop such cores. It's not something I have time to get into myself and I'm sure there are people who could do it, but a shame that people don't share the future vision of updating the original hardware. It also saddens me that the Atari docs of the custom chips have been lost. If us hardware guru's had the original schmatics of the MMU, GLUE, SHIFTER, DMA etc then we could port them over to a PLD, then update them, add more features. That would be totally awesome. Though I have basically given up looking for such diagrams. It looks like our old Atari's will have to stick with whatever boosters I can come up with. Next step as said before, is overclocking the MMU for faster ST-RAM access. I really wanted to avoid overclocking chips. All my booster designs so far use faster more capable chips. Though with no real alternatives to the MMU, overclocking is the one way forward. - I'm sure you all want to check out his website right now! - Itching to see what he sells and is currently developing? I bet you are, then clickety click right here. - Take a look at his FloppyShop website which is simply an AMAZING resource!! - Don't forget to keep your Atari ST clean and free of those horrid virus' with the latest UVK! - Here is a TV appearance which nicely follows up on the amazing interview with Chris Swinson! Son Shu Shi was released back in 1991 by Expose and is a gorgeous platformer not unlike many others you've already played. It reminds me of Enchanted Lands but it's far better (superbly balanced) gameplay. Here we have a brand-new demo that has just been released & ranked 1st for the "oldskool" combo at Riverwash 2015 party. It requires a juicy 4mb Atari STe to run and is fantastic!! Download from Demozoo right now. Getting an Atari ST after all these years is such a joy and I feel like a teenager again!! However, this also means that I have the problem of how to get downloaded software from my Mac onto an Atari floppy disk. This might be the most awesome 16-Bit computer but it has no ethernet, USB, WiFi... So how can we get files onto an ST? Well, one option is ParCp-USB by Petr Stehlik. This is little device plugs into the ST's parallel port and features a Mini USB socket so we can connect any Atari computer to either a Mac or PC with ease. The next thing to do is decide which of your computers you want as either a server or a client because one machine must be serving files whilst the other is the client that accesses this machine. I've recorded a video to demonstrate this: my Atari ST is running the server software whilst my Mac connects to it. The caveat is the need for a hard drive because floppy disks are too slow and will time out. However, I have no hard drive myself but can confirm that a RamDisk works just fine. ParCP-USB is a fantastic product that makes the job of transferring files a doddle. Highly recommended. Captain Dynamo was released by Code Masters and is a game I fell in love with from the moment I first heard that funky tune. This is a wicked platformer that transforms you into a superhero, flying up through the most crafty map designs. It feels new and very different and is enormous fun so I'm glad I found this because my day will now be spent playing this great platformer. So let's wear our spandex and be Captain Dynamooooooo!! If you wanna be a superhero too then grab either the floppy or a hard disk installable version right away.